December 3, 2015 1 comment on "Christmas Ornament Wreath"
This is the first year I’ve seen these pretty DIY ornament wreaths. I needed to make a wreath for our daughter’s winter wedding reception, so I decided to make a silver and white version of this ornament wreath. I love how it turned out. You can make this wreath with ornaments purchased from the Dollar Store. You will need a variety of ornaments in different sizes. 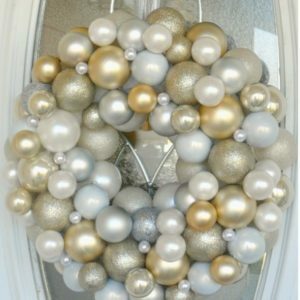 Most of the wreath will be covered with regular sized ball ornaments (30 or more), and then you will need some smaller ornaments to fill in the gaps between the larger ornaments. You can make this wreath in any color. They are beautiful when you make them all one color like red or silver, but using a variety of colors is very pretty too. A silver and white one is very elegant. 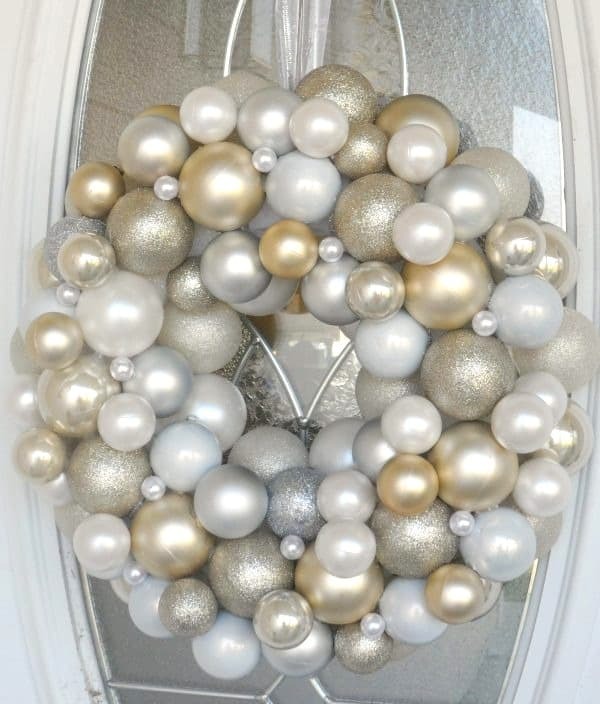 You will want to use shatterproof ball ornaments for this project. They are really popular right now, so also easy to find. You don’t want any of the ornaments to break after the wreath is complete. First remove all the caps off the ornaments. You will be inserting the open ends of the ornaments into the styrofoam wreath. Before I started gluing on ornaments, I decided to tie the ribbon for hanging around the styrofoam wreath first. The finished wreath is a bit bulky, and I didn’t want to have to wrap the ribbon all the way around the ornaments. Next start gluing the regular sized ornaments around the outside of the styrofoam wreath, with the open ends facing the back of the wreath. Have the back of the wreath facing you on the table, with the open ends of the ornaments also facing you. You want to make sure that all the ornaments are laying evenly on the table or when you hang the wreath up it won’t lay flat on the door. Make sure to place some hot glue between ornaments too. You might have to press them together for a few minutes to make sure they take hold. Next glue ornaments around the inside center of the wreath. Now the edges are all done let dry for a few moments and turn the wreath around so that the front is facing you. Continue gluing ornaments to the front of the wreath. To get these ornaments to hold in place better, you can gently press the open ends of the ornaments into the styrofoam and place the glue inside the indentation on the wreath. Continue gluing ornaments until the front is covered. When you run out of room begin gluing smaller ball ornaments in place to fill in any gaps. Pearl beads can also be used to fill in small gaps. After you are finished hang the wreath up and make sure you haven’t missed any spots on the wreath, and enjoy! 1 Comment on "Christmas Ornament Wreath"